Hello sir, I am Kartik. I am from Mysore. 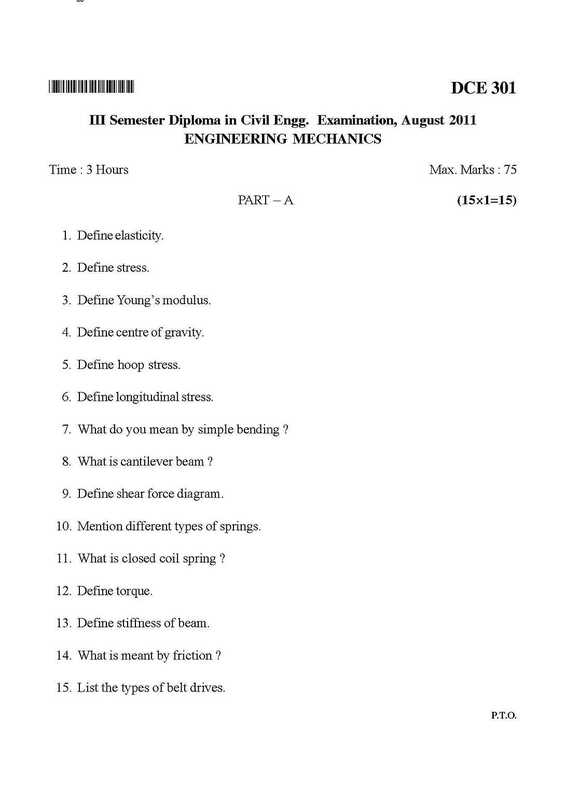 I want you to help me by providing me with the old question paper of 3rd semester Engineering Mechanics of Diploma in Civil Engineering (DCE) course of Karnataka State Open University (KSOU). Can you help me? Where is Karnataka State Open University? 4. Define centre of gravity. 7. What do you mean by simple bending ? 8. What is cantilever beam ? 9. Define shear force diagram. 10. Mention different types of springs. 11. What is closed coil spring ? 13. Define stiffness of beam. 14. What is meant by friction ? 15. List the types of belt drives. 16. Explain stress-strain diagram for a mild steel with a neat sketch. having equal flanges 120 mm Ã— 20 mm size and web 120 mm Ã— 20 mm thick. per unit length, over the entire length. 19. State and explain the different types of gears.